An inexperienced and injury hit Matlock capitulated in the final twenty minutes when the fancied hosts banged in four goals to add to the two they had scored earlier to heap more misery on Matlock supporters. The Gladiators had given as good as they received in an even first half which saw them just a Jack Thomas goal in arrears at the interval. 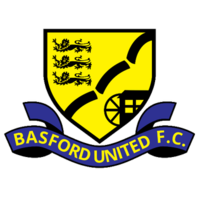 But their makeshift defence let in a second on 58 minutes and then after a third with sixteen minutes left, Basford piled on the agony with three more in the final four minutes. It made for an unhappy debut for experienced striker Craig Westcarr, signed on a dual registration basis from Boston United earlier in the day and surprisingly handed the captain’s armband. The signs though have been ominous in the last few games and a look at the Matlock starting line up missing six key players through injury in Adam Yates, Jake Green, Michael Williams, Ted Cribley, Jamie Jackson and Jordan Chapell made the travelling support fear the worst. Into the team beaten by Halesowen in the FA Cup came Ashton Hall, Jack Brownell, Billy Whitehead and Westcarr and initially the visitors were contesting the game well and at times looked the more accomplished side. Adam Smith powered a twenty five yarder and Westcarr nodded a right wing cross from Dan Vann narrowly wide inside the opening five minutes when at the other end full back Liam Bateman dragged his effort beyond the far post. Lewis Carr’s 20th minute free kick flashed a foot past an upright as both sides threatened, Dwayne Wiley flicking a header inches wide from Harry Vince’s 31st minute free kick. But the deadline was broken seven minutes later as Basford were awarded a corner which Matlock were convinced was a goal kick. Richard Walton could not gather the ball cleanly and after it was half cleared, THOMAS netted with a pin point measured effort, bending his shot into the corner from twenty five yards. Matlock responded positively, Smith cutting in from the right only to blast a twenty yarder over the bar and Vince would have been disappointed not to turn home a Westcarr cross after Smith had again instigated the move. It was a big chance. The big challenge for Matlock was to continue the good work of the first half but as the second period progressed, they were on a downward spiral. Walton atoned for his part in Basford’s opener by brilliantly blocking from Nathan Watson who looked certain to score and Kieran Fenton headed wide from the flag kick. But the hosts doubled their lead when COUREY GRANTHAM was in acres of space on the left to fire low past Walton after fine approach play on the right. Watson headed wide as the pressure on Matlock intensified and when Basford attacked down the right again through Zeyn Hakeem, MATT THORNHILL was left with a simple finish on 74 minutes. Matlock’s inexperience was ruthlessly punished in the final stages as the hosts attacked with venom down both flanks,both Matlock full backs, Vann and Ashton Hall, learning painful lessons. Hall brought down Thomas and WATSON scored from the spot for goal number four before young substitute KOLE LAMBERT scored twice in ninety seconds near the death, Matlock again having no answer to the hosts power and pace. The margin was harsh on Matlock but the old saying that you don’t win anything with kids looked to have some credence. Both Smith and Alex Hurst refused to throw in the towel as Matlock’s two best performers, but after an encouraging opening half, again, Matlock were a country mile away from looking competitive at this level. They lack strength in depth and something has to change quickly to prevent them from staring relegation in the face as the season progresses. It really was men against boys at the end.